Mojang Specifications is taking Minecraft into its next phase of development on December 20, along with a rise in price. Believe it or not, while perfectly recreating every Super Mario character in Minecraft block art you've been playing the game's alpha phase the whole time. Minecraft is one of those rare titles where the developer let players pre-order and start playing while it was still in development. 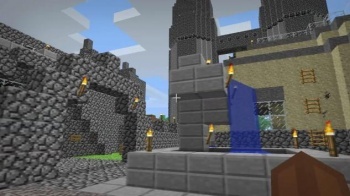 Get ready for a whole new world in the near future because Minecraft creator Marcus Persson has announced that the game is moving into beta on December 20, 2010. Not too much will change right away, but Persson writes on his blog that the beta phase will have "a larger focus on polish and content." The awesome Minecraft Halloween update was just one of potentially many major advancements the game will make before its final version hits the presses. Persson says that Minecraft's beta will start by adding "proper modding support," and is actually looking for input from the game's modding community. The next step will be to add a "non-intrusive narrative" that will give players a reason to exist in Minecraft, and also give them an endgame goal. There will be more time between upgrades, but they'll be more thoroughly tested. One of the biggest points to note in this announcement is that Minecraft's sales agreement is changing. While in alpha, Persson promised the game to all players at 50% off and said that every one of Minecraft's future versions would be free to those that got in early. When Minecraft enters its beta phase, the game will rise in price from the current €9.95 to €14.95 (which is still 25% off the final price), and future versions will no longer be guaranteed free. The changes will only affect people that buy Minecraft after December 20, so if you've been meaning to buy the game, now's the time. These "future versions" will be bigger updates to the game and don't include patches, which will be still be free. Persson also announced that Minecraft gift codes will go live soon, so you can give your friends and family a gift that includes zombie pigs. Is there anything better?